To say that Vincent Larderet is one of the most accomplished of the younger generation of classical pianists would be an understatement. As a Steinway Artist, Mr. Larderet has attracted international recognition by virtue of the exceptional intensity of his performances and commercial recordings, praised by critics not only in his native France but also in Continental Europe, England, the United States, Asia and elsewhere. 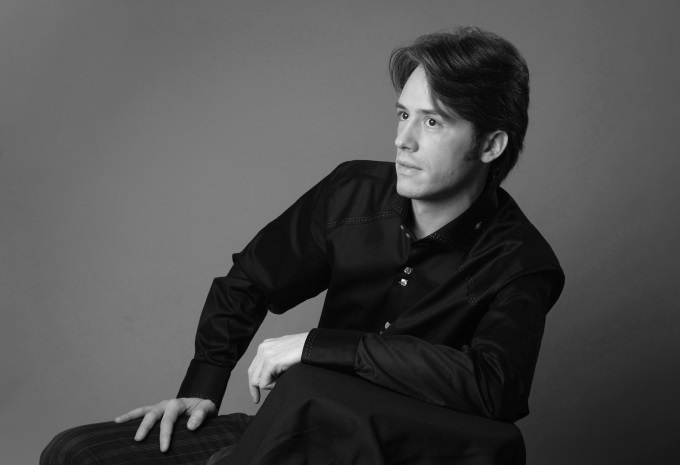 He has won prizes in several international piano competitions such as the Maria Canals Competition in Barcelona, Spain, the AMA-Calabria Competition in Italy and the Brest Piano Competition in France. 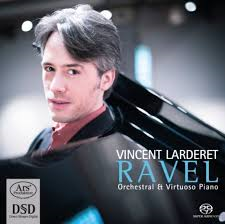 The list of Larderet’s recital venues and the orchestras with which he has performed worldwide is extensive, and including a wide array of international music festivals. 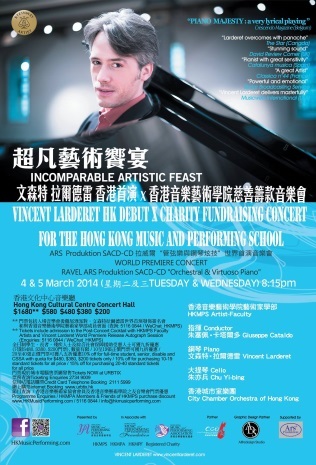 Mr. Larderet’s repertoire is broad and inventive, ranging from Domenico Scarlatti to Pierre Boulez. In addition to acknowledged masters of the keyboard like Beethoven, he has a passion for the piano music of composers like Karol Szymanowski, Alexander Scriabin, Manuel De Falla … and Florent Schmitt. 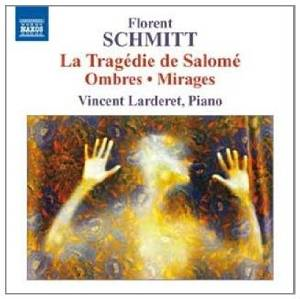 In fact, in 2011 NAXOS released Vincent Larderet’s recording of three major solo piano works by Florent Schmitt — a recording that was highly praised at the time of its release and went on to win a number of awards. PLN: How and when did you become acquainted with the music of Florent Schmitt? VL: I discovered the music of Florent Schmitt during my adolescence. 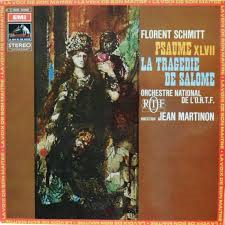 The first work I came to know was La Tragédie de Salomé, in the beautiful rendition of Jean Martinon conducting the ORTF Orchestra, released by EMI in 1973 along with the Psaume XLVII. 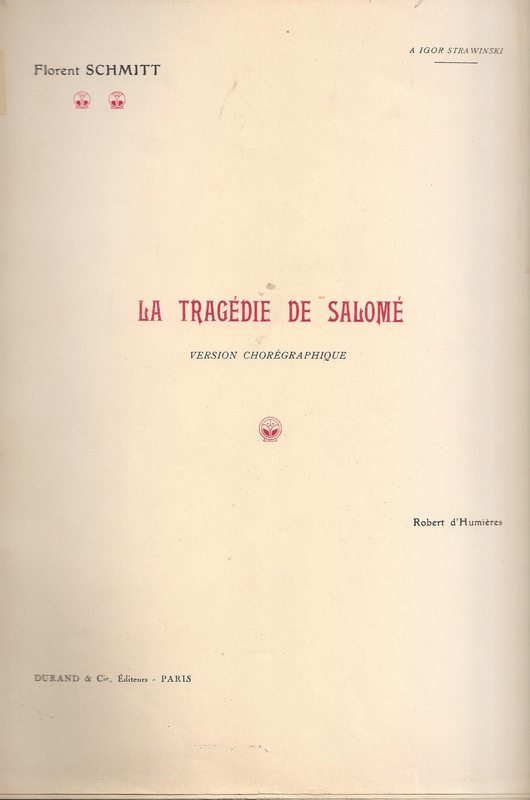 Early Inspiration: Jean Martinon’s recording of Florent Schmitt’s La Tragédie de Salomé. From there, I expanded my interests to all the other works I could find by the composer. Alas, there were few recordings at the time — but some very fine ones were Ombres and the Piano Quintet. In more recent years, there has been a great renaissance for Schmitt, but primarily in the international market. Indeed, here in France he is still misunderstood and needlessly punished for being considered a “Collaborateur” during the war years of 1940-44 [a supporter of the Vichy French government]. PLN: What attracted you to Schmitt’s music? Are there stylistic elements that you find particularly unique or compelling? VL: I have a predilection for Schmitt’s post-impressionistic works such as Ombres, but I also appreciate his other periods. What impressed me immediately about Schmitt’s music was its individuality. Despite its inevitable influences, Schmitt’s music is like no other composer’s. In this regard, Schmitt is similar to Karol Szymanowski [Polish composer who lived from 1882 to 1937], whose works and musical language also went through several distinct stylistic periods. In my view, Schmitt’s music remains unclassifiable. Indeed, his music has been described in many different ways: impressionism, expressionism, Fauvism (Salomé), neo-romanticism (Psaume XLVII) and neo-classicism. Despite the differences, there is always a sensuality that runs throughout Schmitt’s music that seems to me very important — sensual sounds and colors. More specifically to my own instrument, I consider Schmitt’s piano writing to be very original as well as highly interesting. Because of its polyphonic nature and its complexity, it is particularly difficult to play. It requires very big hands to navigate all of the notes and phrases! PLN: How would you characterize Florent Schmitt’s place in the musical and artistic milieu of Paris during the decades when he was most active? VL: It’s clear that Schmitt held an important position in Parisian musical life. Of course, one reason is because of the richness of his catalogue which totaled 138 numbered compositions. But Schmitt was also an innovator. Along with Ravel, Koechlin and Fauré, Schmitt was a founder of the Société musicale indépendante. Les Apaches, pictured in Georges d’Espagnat’s painting of 1910. 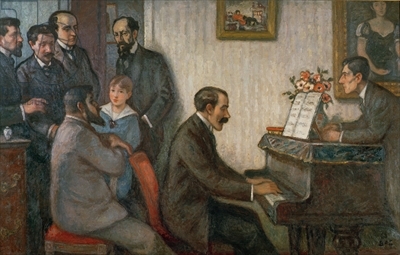 Florent Schmitt is at far left … Maurice Ravel standing at the piano on the right. He was also a member of Les Apaches, which included, among others, Roussel and Ravel. A great symbol of the cultural effervescence of La Belle Époque, this group of musicians, artists and writers would meet regularly until the outbreak of World War I. Finally, as the music critic for the Parisian newspaper Le Temps, Schmitt defended the innovative trends in musical expression of composers like Schoenberg, Stravinsky, Honegger and Villa-Lobos. PLN: You recorded an album of Schmitt solo piano works in 2011, released by NAXOS. Tell us how you came to select the repertoire on that recording, which includes two suites (Ombres and Mirages) as well as La Tragédie de Salomé. VL: When I was offered the opportunity to record a disk of piano music devoted to Schmitt, it was obvious to me that I should include two important post-impressionist works: Ombres and Mirages. Both of these works call for a sort of “transcendental virtuosity.” It is particularly evident in the first movement of Ombres, “J’entends dans le lointain …” (“I hear in the distance …”) — a piece that has been compared to Ravel’s Gaspard de la nuit. Knowing the propensity of Schmitt to create alternative versions of some of his works, I asked the Parisian music publisher Durand if there was a piano version of La Tragédie de Salomé. Indeed there was — and it was one prepared by Schmitt himself! To my surprise, no other pianist had ever shown interest in recording this absolutely brilliant piano version of the music, so this became its world premiere recording. La Tragédie de Salomé is one of the most difficult piano works I have ever performed — on par with Beethoven’s Hammerklavier Sonata and Ravel’s Gaspard de la nuit. 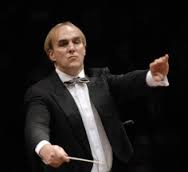 PLN: Regarding La Tragédie de Salomé, it’s certainly interesting to hear music that was originally scored for a vast symphony orchestra performed on the piano. In your opinion, how successful was Schmitt in capturing the drama and excitement of the ballet in his solo piano version? VL: The piano version of Salomé was published in 1913, one year following the revised version for orchestra. It has exceptional impact because it is extremely authentic — and it clearly gives the illusion of being a work originally composed for the piano. It is quite an accomplishment to achieve good pianistic execution while at the same time capturing the orchestral flavor with Fauvist colors. And there is also the percussive side, such as in the final Danse de l’effroi which anticipates Stravinsky’s Le sacre du printemps. Furthermore, it is important to note that Schmitt did not “overload” the already highly complex musical notation just to achieve more of a pianistic quality. His version of Salomé for piano is every bit as authentic as is Ravel’s version of his own La Valse for piano. What we know is that Schmitt was an experienced pianist — more so than Ravel — and he knew exactly how to make the piano sound most effective. In any case, I consider neither the Ravel La Valse nor the Schmitt Salomé to be a transcription or reduction. Instead, they are different versions of these works – and thus deserve to hold a place of their own in the piano repertoire. 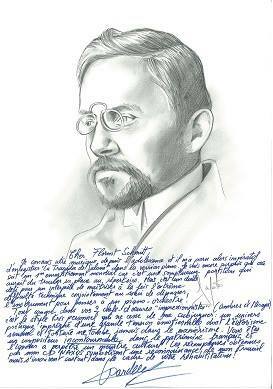 Florent Schmitt published his own solo piano arrangement of La Tragédie de Salomé in 1913, one year after completing the revised orchestral score of the ballet. PLN: It seems that a number of French composers like Ravel and Schmitt were particularly keen on preparing piano versions of their orchestral works. Why did these composers prepare them? What makes them worthy of study and performance today? VL: In the case of Ravel and Schmitt, the piano and the orchestra were “alter egos” in either direction: The piano was equal to the orchestra, and the orchestra inspired the piano writing. What we find is that the works have equal impact whether presented on the piano or by the orchestra — be it, for instance, Ravel’s Valses nobles et sentimentales, Le Tombeau de Couperin, Une barque sur l’Océan and Alborada del gracioso or La Valse … Schmitt’s Mirages or Salomé … or other works. One may prefer the orchestral version or the piano version, but there is no denying that each version has its own uniqueness and authenticity! Regarding Ravel, I recently recorded an entire SACD-CD program on the German-based ARS Produktion label called “Orchestral and Virtuoso Piano.” I wanted to draw attention to the orchestral character and virtuosic style of Ravel’s piano compositions. Ravel described La Valse as a “choreographic poem for orchestra.” The Pavane pour une infante défunte was written for solo piano in 1899 and orchestrated by Ravel in 1910. Contemporaries such as Vlado Perlemuter also confirm that Ravel underscored the orchestral nature of the piano score in Gaspard de la nuit. Ravel also created his own suite for piano based on Daphnis et Chloé (a choreographic work for chorus and orchestra) — published in 1912 just as he did the two orchestral suites from the complete score. My recording is the world premiere of this piano suite. Incidentally, we can also see a similar approach taken by Stravinsky in several movements from his ballet Petrouchka. In this case, Stravinsky produced a virtuoso suite in three movements for solo piano that is exceptionally forceful and dramatic. In some other cases, preparing a piano version was designed to be a convenient way to perform or rehearse a composition before the orchestral version appeared — particularly for the choreographic works. We need to distinguish these kinds of compositions as a “reduction,” designed with a practical or functional goal in mind. Why would composers have bothered to rewrite their own works for another instrument? One reason may be because the piano version can actually influence and inspire the orchestral version, and vice versa. Claude-Achille Debussy. Florent Schmitt (b. 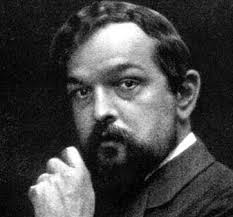 1870) was born in between Debussy (b. 1862) and Maurice Ravel (b. 1875) — but would outlive both by decades. Now, this was not the same with a composer like Claude Debussy. Indeed, Debussy’s works weren’t created by the composer in both piano and orchestral versions. 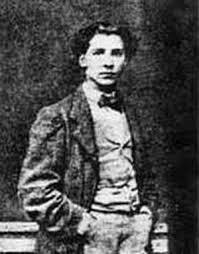 I once had an opportunity to join my pianist colleague Michel Dalberto in performing La Mer in a transcription for two pianos prepared by the composer André Caplet. It is interesting and fascinating music … but it is merely a transcription. PLN: Tell us more about the success of your NAXOS recording featuring Schmitt’s solo piano music. How has it been received by critics and the general music public? PLN: Have you ever had the opportunity to perform Schmitt’s piano music in recital? VL: Yes, I have played the works recorded by NAXOS in concert as well. The reception has been positive — especially for La Tragédie de Salomé, which always impresses audiences. It seems like the public is pleasantly surprised to discover that the quality of music they don’t know is better than they expected it to be. When it comes to appreciating less familiar music, the public needs to hear an explanation: understanding the historical context, the musical language of the composer, and so forth. In some of the concerts where I’ve performed Schmitt’s music, I have spoken of these things to the audience, which helps in their comprehension and appreciation. Today, with all of the recordings dedicated to Schmitt’s compositions now out on labels such as NAXOS, Chandos and Timpani, I hope that even more music lovers will come to know and love this music. PLN: What other works by Schmitt have you studied? Are there any scores that you find particularly worthy of performance and recording? VL: There are so many works of Schmitt that I like. His piano music alone would require about 10 CDs to record! But in particular, I love the Sonate libre en deux parties enchaînées, the Symphonie Concertante and the Piano Quintet. All three are particularly noteworthy creations that I hope to have the opportunity to perform — or even record — in the future. 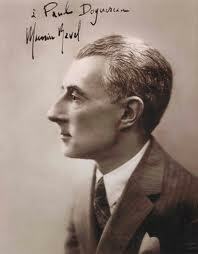 My next recording is of Ravel’s two piano concertos (the Piano Concerto in G and the Piano Concerto for the Left Hand). They will be recorded by ARS Produktion and released in May or June of 2015, with the OSE Symphony Orchestra [Orchestre symphonique nouvelle génération] directed by Daniel Kawka, who is a great conductor. I’m pleased to report that this new recording will also contain a major world premiere by Florent Schmitt as well — but I won’t say anything more to keep the suspense going until then! I have had the opportunity to perform in the United States, and I hope to be back there again soon. Perhaps the release of this new recording will be a good opportunity for that to happen. PLN: Are there any other points you’d like to make about Florent Schmitt and his music? VL: One additional point is this: I find the continuing controversy here in France about Schmitt’s political views to be ridiculous, bordering on the obscene. Certainly, the music of Schmitt never showed any political inclinations. One should not confuse between the creative output and the moral or political judgments of a man. It is very curious that many Collaborateurs during World War II were more involved in those activities than Schmitt, and yet they do not experience any sort of criticism or censorship. An example is the pianist Alfred Cortot, who was highly active in the Vichy regime. Yet today we speak of Cortot’s legendary performances, not his political viewpoints or activities. My position is this: Instead of engaging in virulent polemics, we are artists in the service of art. We are not investigating judges — nor should we be. Coming from a family that was active in the Resistance has allowed me to talk frankly about this state of things. I am committed to freedom of expression; censorship in art for political reasons should never be tolerated. We must “turn the page,” and in this sense the Schmitt renaissance is warranted and welcome — whether some in France choose to follow or not. I have known your music since my adolescence, and therefore it seemed imperative to record La Tragédie de Salomé in your solo piano version. I am surprised that it is the world premiere recording because it is a sumptuous score that should have found its place in the repertoire long before. But it is a double challenge for an interpreter to master both the extreme technical difficulty and to go beyond the instrument to think of a piano-orchestra treatment! Just as in your two “impressionist” masterpieces (Ombres and Mirages), it is the very personal style that never ceases to captivate me: a poetic universe imbued with a great emotional tension — and yet whose sensual and tortured esotericism never falls into mannerism. You are an essential composer in the French heritage, and ignoring your art has been cultural malfeasance. The positive attention my NAXOS CD has generated represents recognition of my work — but even more so your rehabilitation! Speaking as someone who has thoroughly enjoyed Vincent Larderet’s NAXOS recording of Florent Schmitt’s music for solo piano, I hope he will return to North America soon — and I’m even more hopeful that the music of Schmitt will appear on some of his concert and recital programs when he is here. This entry was posted in Classical Music, Composers, French Composers, Piano Music and tagged Alfred Cortot, Classical Music, Classical Piano, Claude Debussy, Daniel Kawka, Florent Schmitt, French Composers, Igor Stravinsky, La Tragedie de Salome, Les Apaches, Maurice Ravel, Michel Dalberto, Mirages, Ombres, Piano Music, Salome, Schmitt, Societe musicale independante, Steinway Artists, Vincent Larderet. Bookmark the permalink.